What to plant this time of year? Just when everything looks bleak and bare we have some good suggestions for still getting out there and working the yard! Bare root deciduous fruit trees - continue planting them thru February. Encourage reliable fruit tree harvest by choosing varieties that require less then 400 hours of chilling, a normal period of cold weather necessary for trees to produce fruit. Proven performers include 'Anna' and "Dorsett Golden Apple". Gold Kist Apricot, Santa Rosa Plum, Tropic Snow white flesh peach and Wonderful Pomegranate. 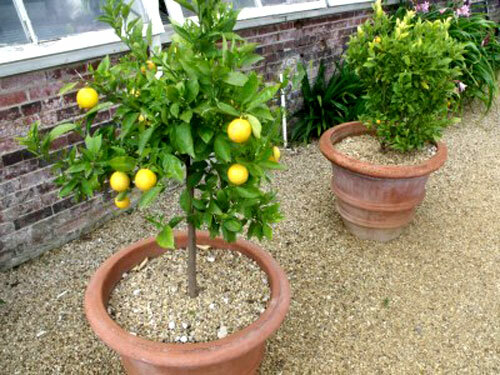 Plant them in decorative glazed planters and stage them around your patio area, for color and fragrance. Yummy! 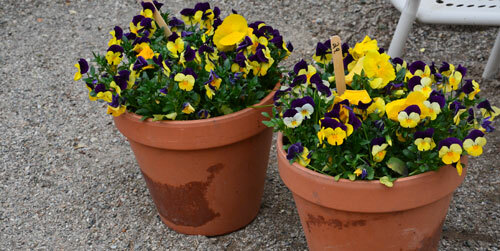 Transplant easy to grow sun lovers such as calendula, dianthus, gazania, marigold, pansy and viola. 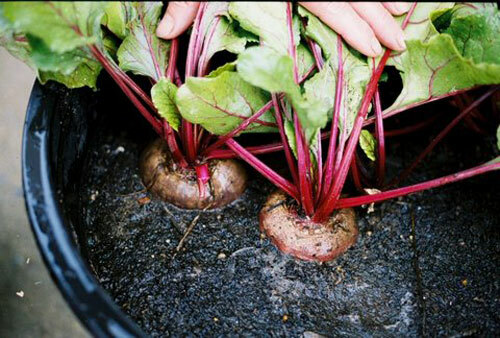 There is still time to sow cool season culinary favorites such as beets, bok choy, carrots, chard, collard and mustard greens, endive, green onions, lettuce, leeks, peas, radishes, spinach and turnips. Transplant broccoli, cabbage and cauliflower into new larger planters. Sow or transplant cilantro, dill, garlic, parsley, and thyme. Use decorative containers to add a bit of pizzazz to your garden or patio area. Cut back established roses by one third. Wait to prune heritage roses until after spring blooms. 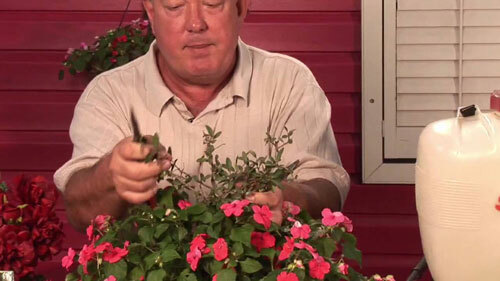 Hold off pruning first tender potted plants like citrus, hibiscus, natal plum and bougainvillea. Just take your time and keep working it and you will have great success and beautiful potted plants. Read more....Shrubs plain and simple. 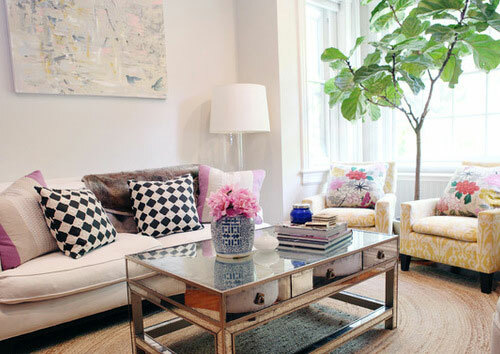 Just looking at colorful, potted greenery is proven to tame tension, boost mood and ward off colds! Here are 3 easy-care varieties. 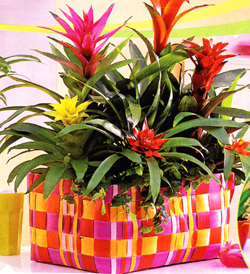 Bromeliad: With lush evergreen foliage and huge colorful blossoms that will last two to three months, exotic bromeliads make an instant statement. The potted plants thrive in bright, indirect light and can withstand temperature fluctuations, making them ideal near a north or east facing window or french doors. A yellowish tinge means your bromeliad is getting too much sunlight. Another plus is they need very little water and take in moisture through their leaves. Just mist them with a spray bottle once or twice a week rather than watering their roots. Since the plants are color colorful when in bloom you don't need to plant them in a bright container. Use earthy terracotta clay or Vietnamese imported black clay pots and create a truly beautiful arrangement with lots of contrasts. 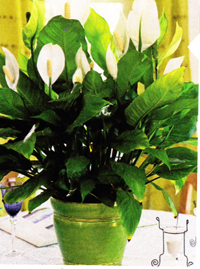 Anthuriums can tolerate lower light they still need a lot of bright, indirect sunlight to grow more flowers. To ensure plentiful year-round blooms, place the decorative potted plants in a northern or eastern window, or curtained southern window in a slightly warmer room like the kitchen. Aim to keep them moist because you never want them to completely dry out. 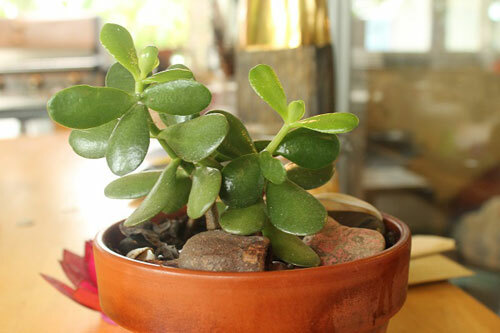 Water the potted plants once or twice a week or more often if the leaf tips brown or dry out. Use a colorful container to add depth to the mostly green plants. Peace lilies thrive in lower light even florescent light is enough. 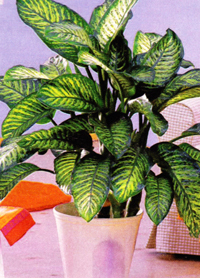 Try placing one in a bathroom where the humidity is ideal for the moisture loving potted plants. The soil should dry out only slightly between watering, and they will remove chemical vapors like acetone and alcohol from the air in the room. If your bathroom has no natural light, rotate the potted lily out once a month and place it across from a curtained north or east facing window for about a week to get the fullest year round blooms. 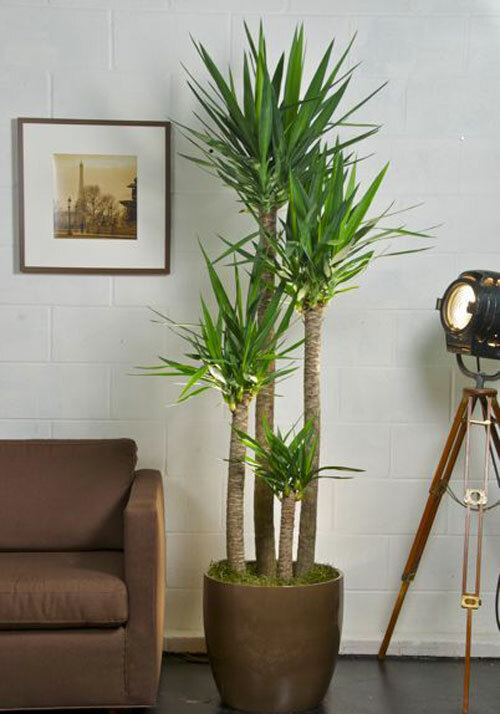 Use a indoor ceramic container with this plant. Make sure if there is a drain hole in the bottom that you have a saucer to catch water run-off. Now is the time to think about next Spring. Who doesn't like to welcome your guests into your home with a warm and inviting entryway? Well here are a few tips on how to plant a colorful window box that provides a cheerful greeting! A Choose a lightweight planter with holes in the bottom for drainage or a wonderful clay planter made of real terracotta. Either way get a plastic liner that slips in and out of the decorative container. This allows you to switch the planting easily as the seasons change. Use all purpose potting soil and fill the bottom of the planter with our pot filler, packing peanuts, corks, crushed cans or anything light that will take up space, not add weight and help so you don't need to use as much soil. Minimizing the weight will really help to prolong the life of the planter. Mix in slow release fertilizer which provides nutrients to the plants for several months. Moisten the potting soil well. Select plants according to preferred light exposure and how frequently you will be able to water. Space them closely for a full look and of course add something to trail over the planters edge. Read more.....It's now or never on bulbs.